The purpose of this lab is to find the ideal water to pressurized air ratio that omits the greatest amount of thrust for a water bottle rocket. By using empirical data collected from the SRETB 2.0, a thrust vs. water/air ratio was made for the purpose of creating a theoretical equation. A wind tunnel was also created in the hope of discovering different engineering concepts to reduce the drag of a water bottle rocket. All of these research endeavors are for the purpose of studying and understanding the aerodynamics and rocketry behind water bottle rockets. This is experimental and theoretical data for 1250 mL of water at 30 psi. 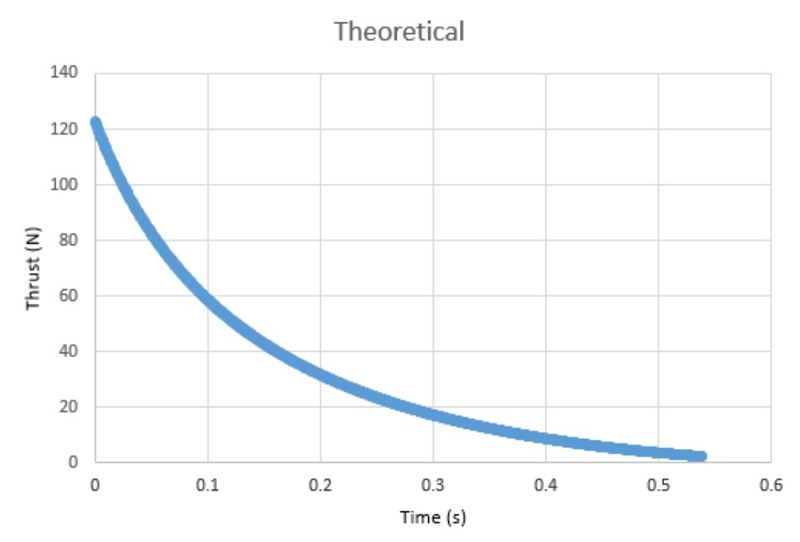 The thrust at time 0 in Figure 2 is about 3 times the thrust at time 0 in Figure 1. We are comparing a video analysis of the launch, frame by frame, to the experimental and theoretical data to get a better understanding of why there are bumps in the experimental graph. We are going to be communicating with outside help for our theoretical equation. We have also been looking at our experimental data. We are looking into the connections between the theoretical and experimental. We have been working on getting data and on understanding the problems with it. There is an issue with the bottle bouncing again and we are working to fix it. Yesterday we attended the Dark Matter Day Party. We have been working on solving the theoretical ratio for this project. We are also working to find and fix leaks in the launching mechanism. Next week we will be presenting at WISRD Fall Poster Night. Welcome to the new members of the Aerodynamics team. This year we plan on finishing the theoretical aspect of this project. We are working on new nozzles to have better laminar flow while launching. We also hope to finish testing the theories to find the ideal ratio. We have a new launch needle that is replacing the old sports needle. We will be presenting at WISRD Spring Poster Presentation and Lecture next week. We will continue with tests and the math surrounding it soon. We have finished the first draft of “The Engineering Design Process of Constructing a Static Rocket Engine Test Bed” and will be published later this year. We will be working on the rest of our articles soon, as well as collecting more data in the SRETB 2.0. We are currently writing out first of three research papers on this lab. We are writing the “The Engineering Design Process of Constructing a Static Rocket Engine Test Bed”. This paper should illustrate the process leading up to the creation of the SRETB 2.0. There are many educational purposes and research outcomes of this engineering challenge of creating a rocket test bed for a water bottle rocket. We hope to publish this article in the WISRD Journal. We have found 5 more points towards finding the optimal ratio. We are working on getting more points and finding a curve. 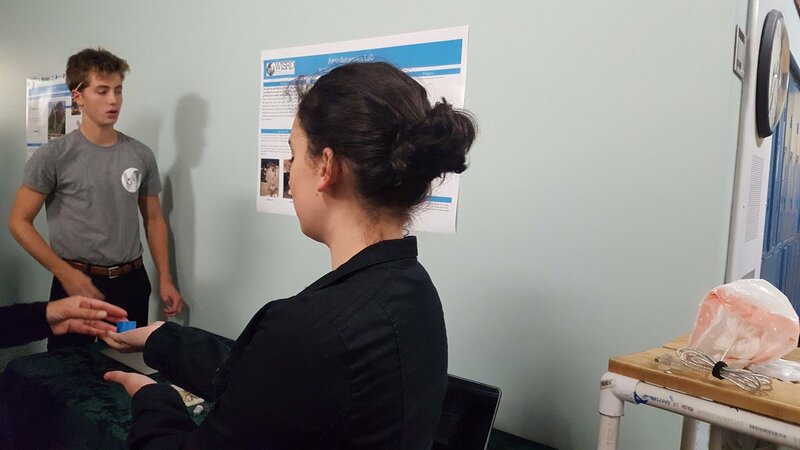 Last Monday we presented at WISRD Fall Poster Presentation and Lecture. We were able to reach out to a large group of people. We are collecting a few more data samples in our thrust vs. water/air ratio graph so we can create an equation that fits the curve. We first built the SRETB 1.0 (Figure One) where the rocket would be launched up to hit the force plate. We realized many problems with that. The SRETB 2.0 (Figure Two) fixed many of the problems by having a drop launcher. This year in Aerodynamics we will be finishing static tests on the SRETB 2.0. We are still trying to find the ideal ratio of water to air. The wind tunnel (Figure Three) now has the propellors on. We are still waiting for an anemometer to test the drag and wind speed. Thanks to Kai S. and Cameron for building our fans. Data and graphs will be posted soon. On Monday, December 5, 2016, Molly will finish the frame the rocket is going to be set off in. Molly and I finished our poster presentation at Wildwood a week ago. It was a really fun night, and the lectures were really amazing. Here is our poster: Wind Tunnel Poster. We will be having another poster presentation in the Spring. The wind tunnel is almost done, we are waiting for the Engineering team, Cameron, and Kai, to setup and install the fans for the wind tunnel. We will also be installing a smoke generator after the fans are assembled to the tunnel. Right now, Molly and I are getting ready to do Test #1 , where we will be collecting data on the thrust of different ratios of water to air. In Test #2, we will be testing different PSI pressures to find the best pressure to use for future tests and experiments. Before doing Test #2, I will be using the data in Test #1 to create a theory. Using the theory in Test #3, I will see if my hypothesis and theory matches the data that was collected. There are two parts in Test #3: the first part is going to be doing Test #1 again, and the second part is going to be doing Test #1 but with different ratios of water to air and using the selected PSI pressure in Test #2. 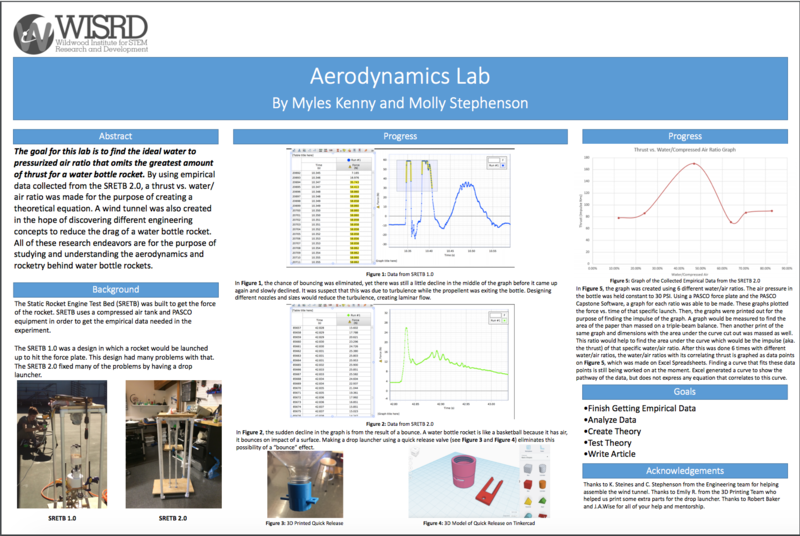 Check in on both of our journals, Myles K and Molly S, to see what we are up to and our progress on the aerodynamics lab. Welcome to the Rocket Crew! This is where Jacob, Declan, and Nanak are working on rocket science. 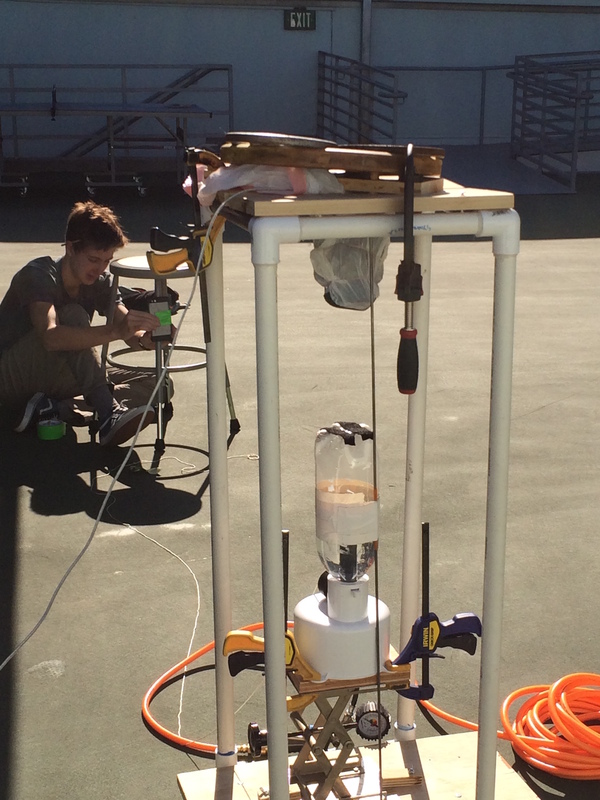 In the first semester, we worked on creating a chemical propellant. We realized that solid rocket engines were hard to build, dangerous, and hard to replicate. So, in the second semester, we began work on water rockets. At the same time, Nanak is working on a wind tunnel for our rockets. For now, Jacob and Declan are working on a mechanism to launch the bottle rocket. Nanak is working on building a Wind Tunnel. Jacob and Declan are also working on calculating theoretical values for the bottle rocket. Since the last update we have calibrated the anemometer and have been able to run all four motors simultaneously. We are currently moving the wiring to a smaller breadboard so that we can fit it into a case with the battery. We have found this code for the motors. Welcome to the new members of the Wind Tunnel Team. Reid will be working on fixing the wind tunnel and testing to see if different parts work. We hope to start testing nose cones and fins soon. We have assembled and approved the final mount design and will start printing large rail segments to mount in the actual wind tunnel. Over the past two days, we have been developing a mount for the anemometer. We are currently 3D printing the design and will assemble it next week. Once this is done, all that is left to do is assemble and wire the anemometer and this project will be done. The only other thing that could be done is a live graph and live averaging function. Based off of the improvements from the last post, we have 3D printed and manufactured a higher quality anemometer. It features larger cups, better assembly, and denser plastic. Now, we will calibrate it and create a mount for it in the wind tunnel. Testing for y-intercept, equation will be confirmed if the y-intercept is close to 0. This is not ideal. Possible causes: vibration(lack of precise 90 degree mounting w/ arms and motor), contact with anemometers arms and mount. Possibly Arduino data. Starting a test calibration for the prototype anemometer. There are already improvements to be made to this design. The biggest issue is the importance of mounting components at perfect 90 degree angles, as currently they are not mounted perfectly and the wobble that occurs is clearly visible. We are performing the calibration with a 3 position fan. We will check to see if all average data points are more or less co-linear after data collection. Today the first prototype anemometer has been constructed. Currently, the cups are too small and positioned in the wrong orientation. This was fixed with a file, but it needs to be reprinted larger and with cups rotated 90 degrees. This jury rigged prototype was tested and it was capable of recording data. Now, all that we need to do is to calibrate it to display windspeed. The anemometer is about to be printed in the 3D printer. It will be put together in April. 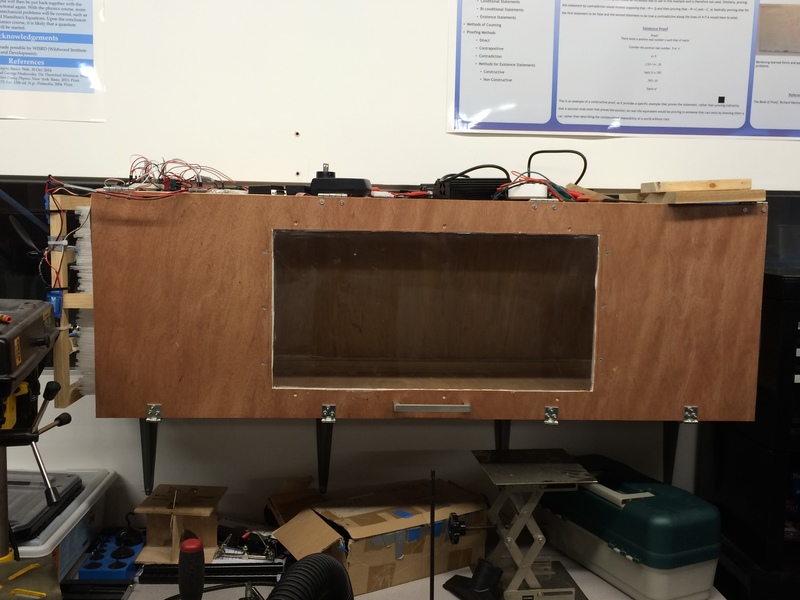 The electronics team integrated the anemometer’s arduino code into the wind tunnel’s fan code. Today the electronics team, Zach and Ras, completed the anemometer’s code. 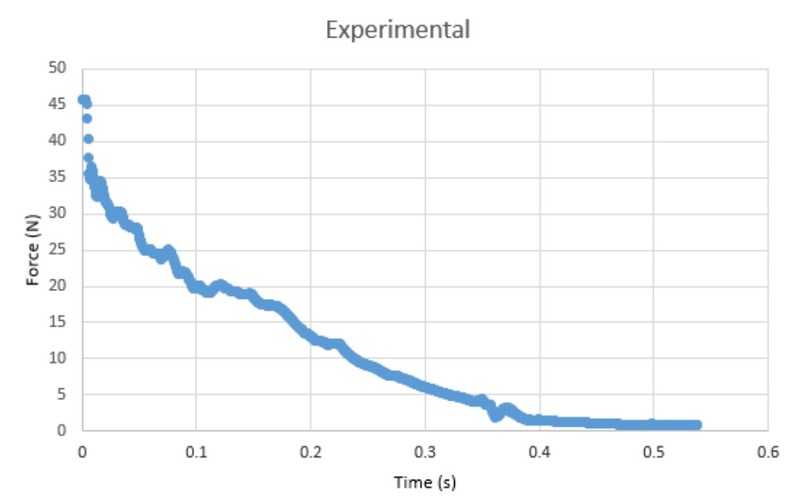 Specifically, we were able to have our arduino output over 1000 data points to the arduino console, and copy and paste them into excel and use formatting options to represent the data as a scatter plot graph. Additionally, the user is able to change the amount of data taken. All that is left to do is create an on/off switch and possibly a RPM counter. The sketch being currently used is available on WISRD’s local network, under Aerodynamics, Wind Tunnel, and then finally the ArduinoSketches folder. Today we had our first formal meeting between Myles, Molly, Emile, and Zach. We discussed progress on the Arduino code, which needs to be de-bugged but has nearly been created. We also discussed progress on the 3D printing of the mechanical parts for the Anemometer. 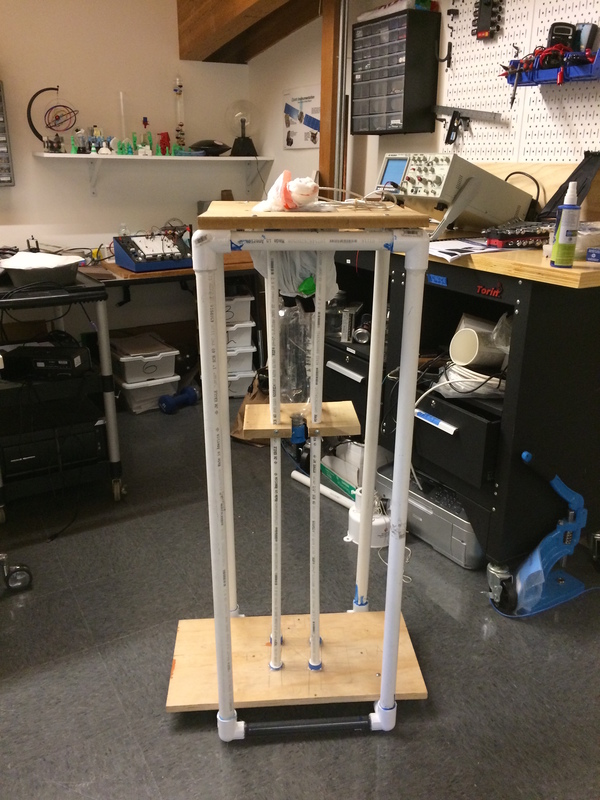 For this, we need to conduct further research/experiments to determine optimal cup size and weight, shaft connections for the cups, and an area for ball bearings or another system that allows the arms to spin.